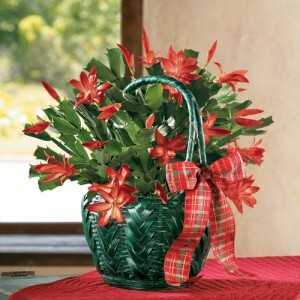 Is your cactus a Christmas, Thanksgiving, or Easter cactus? Did you know that there are actually three different cactuses that most folks think are Christmas cactus (…and by the way, they aren’t cactuses; they are Epiphytes). The beautiful winter blooming plant is a non-parasitic native of the rain forests of Brazil and grows in the tree branches and in rock crevices on the ground, using nutrients from air and rain. There are three botanical names… Schlumbergera truncata, commonly known as Thanksgiving cactus, Schlumbergera bridgesii, commonly known as Christmas cactus, and Rhipsalidopsis gaetneri, commonly known as Easter cactus. The three are known for the month (or holiday) during which they bloom, natively established by their natural elevation in the rain forest. Most of the cactuses we see for the Christmas season are actually Thanksgiving cactuses, forced to bloom for our Christmas season. You ask…How do you know which is which? 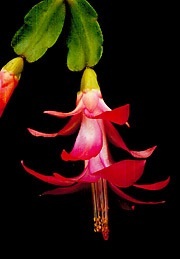 The Christmas cactus (Schlumbergera bridgesii) has flat leaves with rounded smooth teeth and anthers that are purplish-brown. 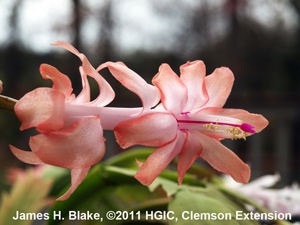 The Thanksgiving cactus (Schlumbergera truncata) has flat leaves with pointed teeth & hairs, and anthers that are yellow. 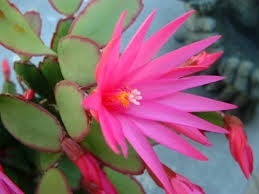 The Easter cactus (Rhipsalidopsis gaetneri) has bristles on the leaf segments; the blooms are star shaped. Many folks have trouble getting the beauties to re-bloom year after year. Quite simply, it seems that neglect works for me. In the spring, I take the root bound pot outside to a shady area for the duration of the summer. Rain is the only water it gets (well, maybe a drink during the dry time). The experts say to fertilize through the summer months with a soluble solution of 20/20/20, but I don’t think I’ve ever fertilized mine. Before frost, bring the cactus inside. The key to bloom is shortened daylight hours with cool 50-55 degree temperature nights of total darkness. (above 65-68 degree nights and it will not bloom). Controlling these conditions will determine when the plant blooms. Letting the fall weather dictate the timing, my cactus bloomed early in November this year. If the humidity in the home is rather low, there can be a problem with bud drop. Broken leaves and stems will root easily in moist (not soggy) potting soil… add about 20% perlite to the mix to get good drainage. Over watering, especially with the Easter cactus, can be their death wish.